Black Friday is usually a big deal in the United States but it has been catching on in Canada. Let’s say that it was a eventful day as I tried to get a new laptop at the Apple Store but they did not have the right model. In a way, Black Friday in Canada was a dud as I did not get anything that was worthy of a great sale. To forget about the unfortunate event, I had the opportunity to go to Magpie Jewellery in Westboro for Arts Nest at night. It was organized by Creative Mornings and part of Support Local by Apartment 613. There were local designers, local musicians, and an artist. There were free food in the form of tacos by Taco Lot and cupcakes! Plus, there was a free swag bag included at the event. All in all, being at Arts Nest certainly erased the frustration from shopping early this morning for Black Friday deals. I did not to stay very long but got to take photos and a few are posted on my Instagram. Gotta hand it to social media or a particular Internet show because last Friday, I had an opportunity to meet up the duo known as SidePonyNation. Tanya and Lynn were in Ottawa as part of Ottawa Race Weekend’s Heath and Fitness Expo at the Ottawa Convention Centre. They were there to sell clothing by Modrobes. I had the opportunity to do an interview and provide them with cupcakes from The Cupcake Lounge. The thing I forgot about Modrobes was that it was featured on CBC’s Dragons’ Den a few seasons ago and also a well known clothing brand. The audio interview is posted below. It’s been a fun month in playing Canadian bands and musicians with Asian backgrounds as part of celebrating Asian Heritage Month in Canada. This Wednesday’s show was getting through the ones I haven’t played from the likes of Wendy Versus and Ember Swift. All in all, it was a blast playing and supporting the musicians and bands with Asian roots. Another note, Cadence Weapon is still number one for the third week on The Wild 10 Countdown. The new entry on the countdown is Kandle. Also on the top 10 are Cold Specks and Metric as they are getting a lot of plays on various radio shows. The playlist for the May 30th show is at this link. The May 30th Radio Show – Press play to listen. It’s fun having someone join me on the radio show. It’s this time of the season when people go away for the next couple of months. Wednesday’s show was my co-host, Lauren’s last show of the season. For the time being, I will be hosting solo until she returns. Overall, she had the chance to interview with the likes of Dan Mangan, Said The Whale and Hey Ocean! on her second season. It’s pretty funny that we got to interview bands from Vancouver. It’s alway a privilege to have someone passionate about Canadian indie music. Also on the show was the interview with Yukon Blonde (another Vancouver band). It’s been awhile I had a chance to interview them because of other events happening. This time, I was able to but without the co-host. The audio of the interview is posted below. On the live show, a guest hung out and it was former host of Horses Spilled Milk, Erica as she wanted to myself and Lauren to go to The Cupcake Lounge due in part being Lauren’s last show for the time being. 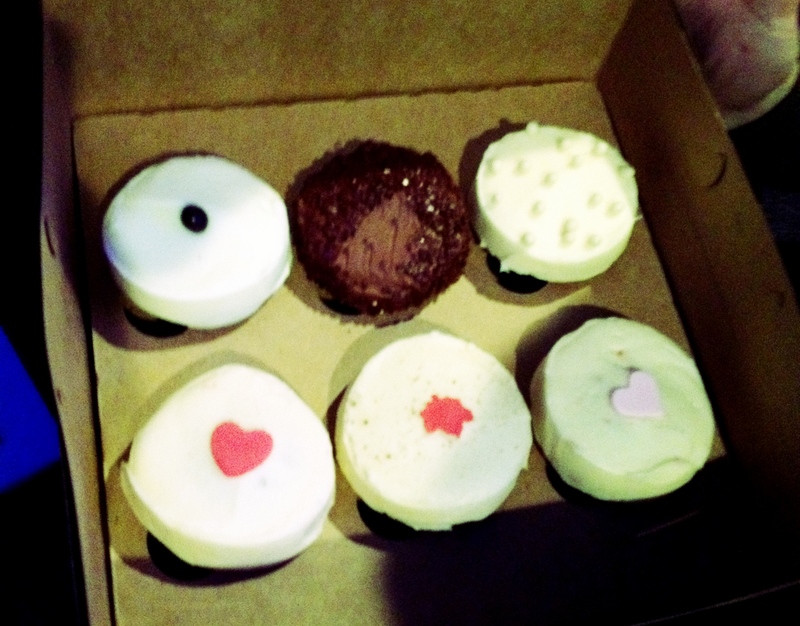 The photo of the cupcakes is shown below. As usual, there’s the Wild 10 Countdown and Lauren’s music picks of the season. You can listen to the show in the Audio section below. The radio show playlist is at this link. On April 15th, I had the opportunity to go to The Canada Aviation and Space Museum for the Kid Koala Space Cadet Headphone Concert. It was very last minute to go and thanks to Apartment 613 for the enjoyable time. I did not realize that snailhouse was the opening act to Kid Koala. I enjoyed the headphone concert and the tracks he performed reminded me at the time when he opened up for the Arcade Fire outdoor at Pop Montreal. For anyone who has me on Facebook and Instagram, I posted some photos on there but I will post them here for your interest. The April 18th Radio Show – Press play to listen. It was a close call for Wednesday’s show because I had a equipment failure on Saturday night as I was doing a pre-recorded interview with Adaline. Luckily, there was a second chance as I did a live phone interview with her. It was almost a disaster because CKCU-FM doesn’t do long distance calls as I would need a long distance card to call outside of Ottawa. Aside from the slight setback, it was smooth sailing from then on as I got to do the interview. You can listen to the interview in the audio section. What I forgot to mention were the opening acts from Saturday’s show. They were Factory Owl and The Watters Brothers. Up and coming local bands. I’ve seen The Watters Brothers perform and they bring a style of Blues which is marvellous. It was the first time to check out Factory Owl and their use of orchestral instruments sounded pretty lovely. Overall, it was good Saturday night to enjoy live music. What was played on the live radio show were songs from Hong Kong films as this Sunday will be the 31st Hong Kong Film Award. It’s become a yearly tradition to play past winners from the Best Song Film category leading up to the award show. As far as I know, it will be broadcast on RTHK Radio 2 and will definitely listen in. Aside from the live show was the top 10 countdown and I haven’t made a set date on resuming the top 10 entries. The playlist is over at this link. The full show – Press play to listen. It’s the yearly festive time as I play a lot of Christmas songs on my radio show at CKCU-FM. Aside from the tunes, I decided to get these unique holiday flavoured sodas by Jones Soda. The flavours were Candy Cane, Gingerbread, Pear Tree and Sugar Plum. One of the CKCU shows I hung out, we tried the Candy Cane Soda. The host’s verdict was that it tasted like something out of the dentist. It’s not in a bad way but he didn’t mind the taste of it. This will be the 2011 edition holiday guide to the shows I hosted at CKCU-FM. I was on the air for Christmas Eve and just played a bunch of Christmas songs and then a few past Christmas #1 UK songs. It was great to play the Christmas tunes everytime. There were a few requests through Twitter and hopefully some were pleased. The full Top 50 of 2011 is over at this link or on the top right of the blog. The playlist for the December 21st show is at this link. I want to wish everyone a Merry Christmas and a Happy New Year! The third part of my Top 50 of 2011 is completed. Instead of playing the top 10, I’ve decided to play the top 11 as it’s fitting that 2011 is ending. This week’s show is slightly different as the first hour would usually be podcasted on this blog. It’s a bit of a flip-flop as the first hour was live and the second hour is for the blog. Both are splitter up for your listening convenience. The playlist for December 28th’s show is at this link. I had the opportunity to do a fill in for a Friday night radio show. I wasn’t expecting to have another final show of 2011. Thanks to the guys from Friday Night Derailment for the last minute fill in. The playlist from the December 30th show is at this link. The December 14th Radio Show – Press play to listen. The December 21st Radio Show – Press play to listen. From Both Kinds of Music’s Both Kind of Xmas Show – press play to listen. The December 24th (Christmas Eve) Radio Show. The playlist is at this link. Press play to listen. The December 28th radio show. Hour 1 – press play to listen. Hour 2 – press play to listen. The December 30th radio show. Press play to listen. 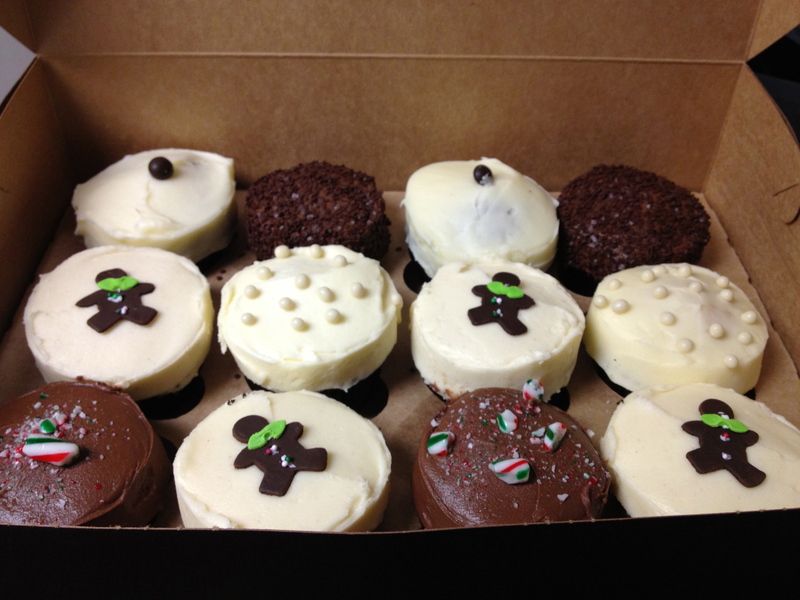 Here’s a photo of cupcakes I got at The Cupcake Lounge on Christmas Eve. What a way to begin a new season for the blog and radio show. It’s the second year to do a show playing moon songs and bringing in mooncakes in honour of Mid-Autumn Festival. This time, I decided to bring a unique kind of mooncakes to CKCU-FM. The ones I brought along were Taro and Sweet Potato cake and the other one with the purple, pink, yellow and white, they were the fruity flavoured mooncakes. Thankfully, I got them at T&T Supermarket and I wanted something different as I haven’t been accustomed to the lotus paste and egg yolk. I’m not a big fan of the egg yolk. Enough on the food and on to the radio show. Now on the third season, it’s filled with great tunes and a returning co-host in some capacity. It’s great to have Lauren back, but I found out that she won’t be on the show for the live part. She will be there for the recorded part, which is the top 10 countdown. All in all, it’s great to get some help. In the first hour of the show, I played Go Outside (Menahan Street Band Remix) by Cults as I was listening to The Strombo Show on Sunday and George played the original version of Go Outside. Wednesday night, we had an opportunity to interview Sara Lowes and an unexpected or impromptu but funny interview with Ben of Said The Whale. It’s great for my co-host to finally get a chance to interview a musician. Expect the interviews to be aired next week. The playlist for September 14th’s show is at this link. The Wild 10 Countdown entry for September 14 is at this link.